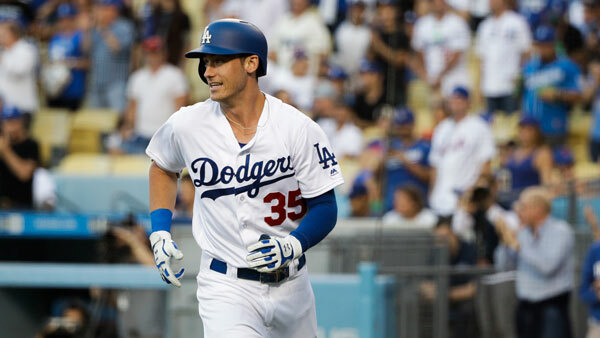 Dodgers rookie Cody Bellinger became the fastest player to 21 home runs in baseball history, connecting in his first two at-bats against New York Mets right-hander Zach Wheeler on Monday night. Bellinger, who was not called up until three weeks into the season, now has 21 home runs in his first 51 games. That surpasses by one the totals of Gary Sanchez (New York Yankees 2016) and Wally Berger (Boston Braves 1930). Bellinger, 21, now leads the National League in home runs. His first game was April 25. Bellinger hit his first home run in the seventh inning against the Philadelphia Phillies' Zach Eflin on April 29. He hit his second in the ninth inning of the same game off Hector Neris. He has five multi-homer games, tying Mike Piazza for the Dodgers' rookie record.